Yesterday, in addition to a reminder to life at life’s absurd moments, it was a reminder of psychic attention and synchronicity as a way of listening to your intuition. 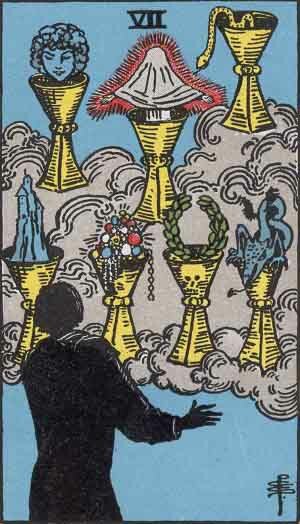 Today;s card reminds me of the infinite possibilities when it comes to intuitive symbolism. Tarot cards and their “traditional” meanings are like those dream dictionaries that give a sort of one size fits all meaning to dream events…but any one symbol can have another more personal meaning based on the individual’s past experiences, and the context of their recent life. I always give that individual resonance far more weight than the “book” meaning. If someone says “I think I know what that is talking about”….then that IS what it’s talking about. By the same token, your hunch in reading cards carries weight in the reading. Cards are just a tool for bringing human intuition to the surface. Cards, runes, tea leaves, palm lines, crystal balls, black mirrors…what have you… are the hook and the bait. Insight, learning and inspiration are the fish we’re after. Now THAT’s a fish in a cup!